Can I drive… no. Really, can I drive… No.Come on… let me drive… NO! Oh #$%^@… Never mind, I don’t want to drive. You take 1 part rocks, 1 part mud and 2 parts gravity shake them all together and you have the 3rd annual Black Friday run. 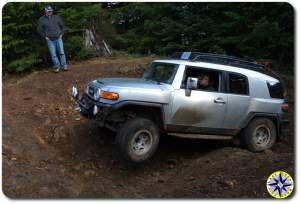 Every year the Northwest FJ Cruiser Club (NWFJCC) holds its off-road 4×4 trail run through the Tillamook State Forest and this year I had the opportunity to introduce a friend to the sport of off-road adventure driving. The club is about family fun and drivers show up with all skill levels. 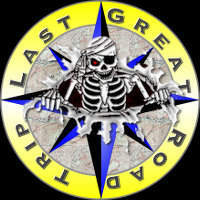 There are folks in the club who have wheeled for years as well as those who are just starting out. Everyone pulls together to get each other through the obstacles and ensure we all learn a little something on each off-road adventure. As you can see by the map of the Tillamook State Forest OVR Park, the forest has a little something for everyone with trails ranging from easy to don’t try this at home, rip your rear axle off, extreme. It even has fun trails for a friend on her introductory run into the sport of wheeling… as a passenger. Power Line is an easy to moderate trail with tight squeezes through the woods, an occasional bump and dip as well as a bunch of twists and turns with great views. 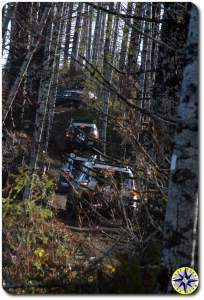 Power Line is the usual warm-up 4×4 trail for the club and this run was no different. 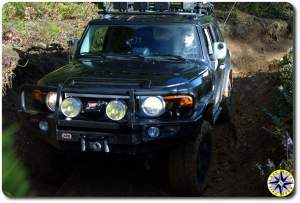 The week had its share of rain but today the sun was out and the rigs were all running good as the drivers got into wheeling mode, exercising their low gears and traction devices for the trails to come. 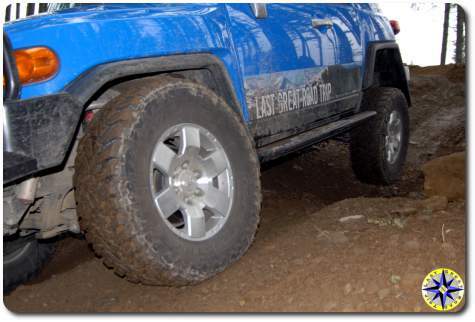 Fire Brake Five is where the rocks, mud and gravity come together. Fire Brake Five is also where the stock rigs usually take the bypass. The skinny peddle is not my favorite wheeling tool but when mud makes everything slick, momentum is king. 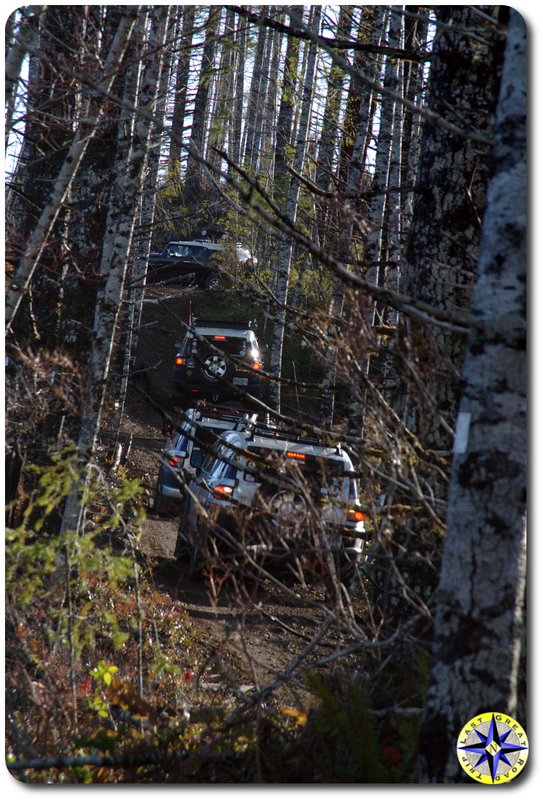 Since you have no traction, keeping the momentum up and sticking to the high side of the rocks allowed us to slip over and past the differential grabbing rocks. Although a couple of rigs got bogged down, a hi-lift jack and a few well stacked rocks made sure everyone made it through unscathed. 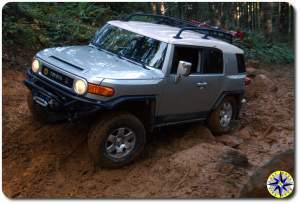 The trails are connected by logging road that take you over the hills of the Oregon Coastal Range. Although the sun was out this day, we still managed to find a little snow hinting of the holiday season. 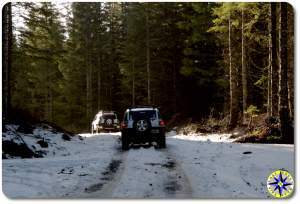 Unfortunately for the us these same roads led the crew to a number of closed trails including the club’s own “Hood Raiser”. A big blow down made the trail impassable and means the club will be back with chainsaws and heavy equipment to clear it’s adopted section come spring time. 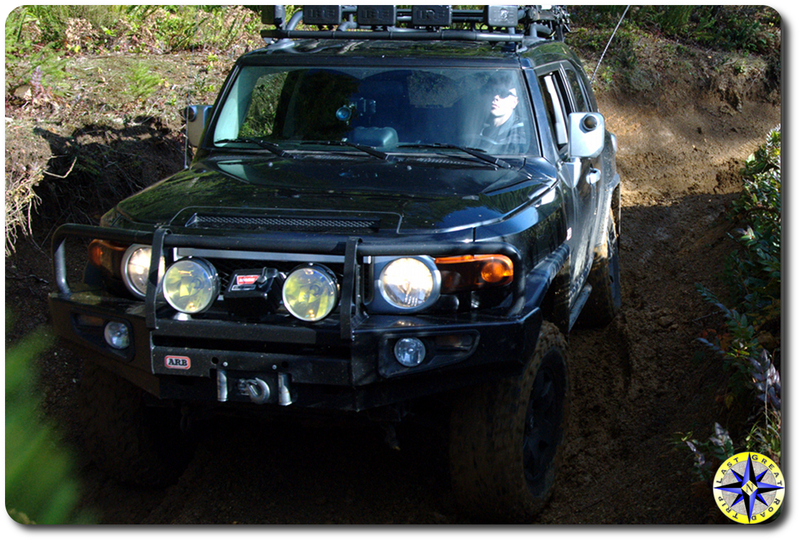 Hog’s Back is one of those climbs that provides lots of off-road fun in a compact package. You come at it on a short hill climb with a chunk of dug out slab rock at the top. Keep your momentum, find the high-side of the dips and ride it out and over the top. 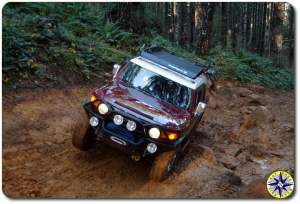 It isn’t until you’re at the top looking back down that you realize just how capable the FJ Cruiser really is. 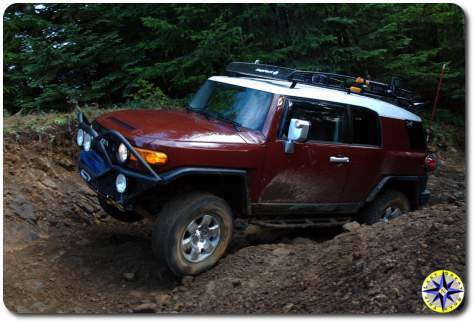 With nothing more then stock tires, A-trac and rear e-Locker the 2010 stock FJ Cruiser in the group (only 400 miles on it) conquered Hog’s Back. It is nice to see how well Toyota built these rigs. For some black Friday congers up over-caffeinated shoppers standing in dark department store doorways waiting to push, shove and edge out each other for the perfect Christmas stocking stuffer at 70% off. For me, the NWFJCC, Hula Betty and my copilot Janet, it means wheeling with friends, picnicking on the trail and a chance to explore the 4×4 trails in the Tillamook State Forest. 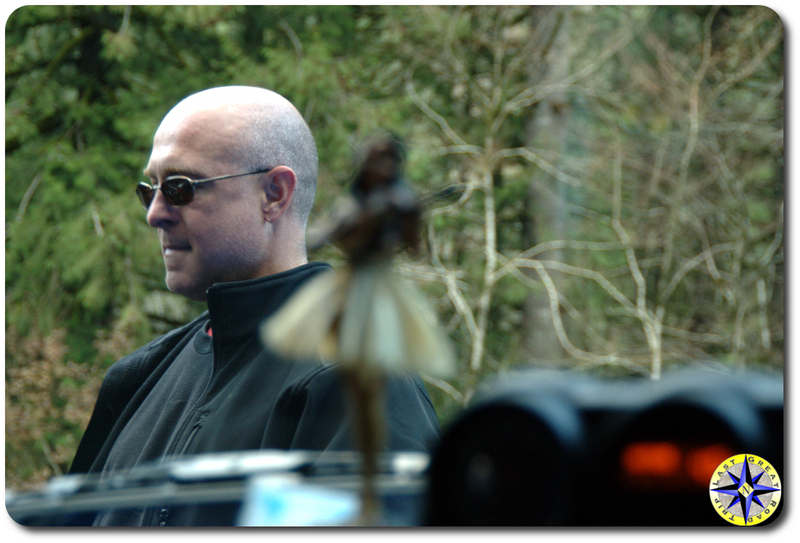 And no… You can’t drive my rig on Fire Brake Five… Really, NO! 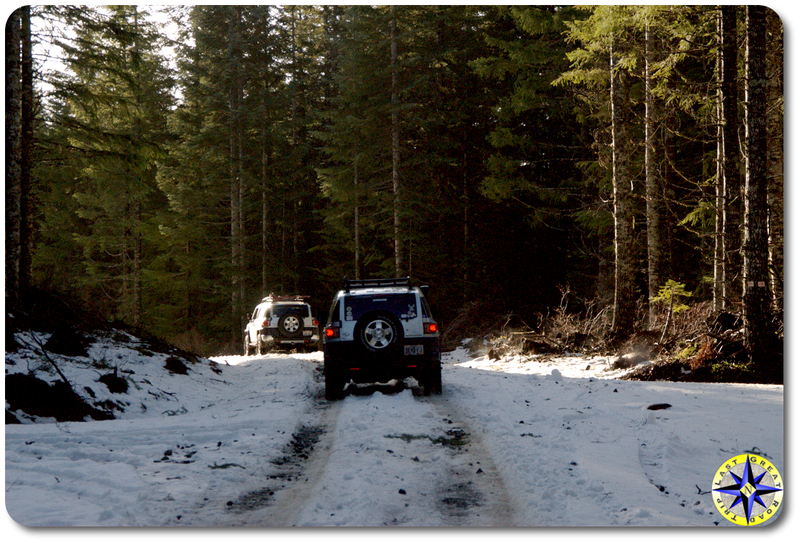 But maybe next time you can take it out on the logging roads. See, I’m learning to share my toys. Baby steps… baby steps. 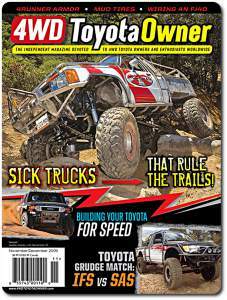 Sick is how 4WD Toyota Owner described our FJ Cruiser and the Total Chaos 2″ long travel kit after they published our article on the install Metal Tech did for us a while back… If you liked the on-line Total Chaos 2″ Long Travel Install video and story, you’ll love this article. While we didn’t make the cover this time, we did manage to get an incredible picture, taken by Dwon Guvenir from Oregon Photo Safaris: Photography Training Oregon Geotoursim, published that really shows off the rig. 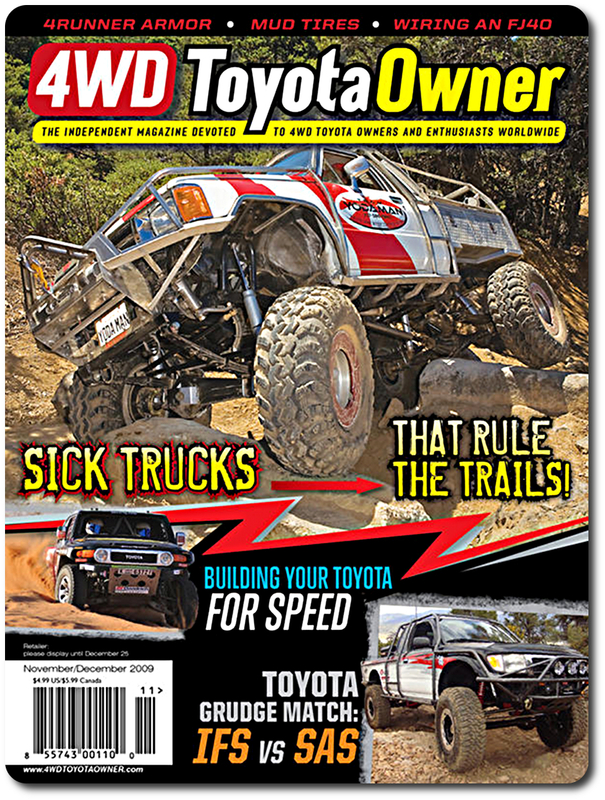 Be sure to pick up a copy of the magazine’s November / December issue on news stands now and let us know what you think.